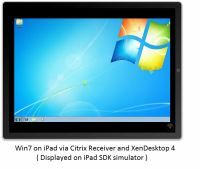 Citrix Systems, a Florida based company providing virtualization and remote access softwares, has announced that the new version of their Citrix Reciever Software will be able bring to Microsoft's Windows 7 Operating System in Apple's iPad. Citix System says that their software will be available in time for the iPad's shipping date. The iPad uses proprietary Apple CPU chip so it is not possible to run Windows 7 natively on it. However, Citrix's softwares solves this by using the iPad like a thin client and connecting it wirelessly to a workstation running Windows 7.The workstation will need to have Citrix System's XenDesktop or XenApp installed and the Citrix Reciever Software will need to installed in the iPad. This means that your iPad will be acting as the display and inputs of the Windows 7 that is running in your workstation. Using this setup you can get features like flash support, background apps which the iPad does not support on its own. Citrix Systems' virtualization softwares have been available for the iPhone for sometime. However, with the iPad's larger screen, it makes perfect sense to use it in the iPad rather than the iPhone.